The horses stretching out on the way up the hills. 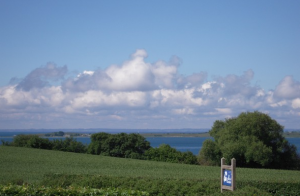 On this weekend, you can enjoy a greater share of the stunning scenery along the South Fyn bridle paths. It will be at the same time a journey through time: along the way you experience the glacial landscape and sees a large number of visible signs of people work here in the area up through the ages from the stone age, broncealderen, the Viking age and the middle ages. The tour begins in M near M farm. Photo Niclas Jessen. 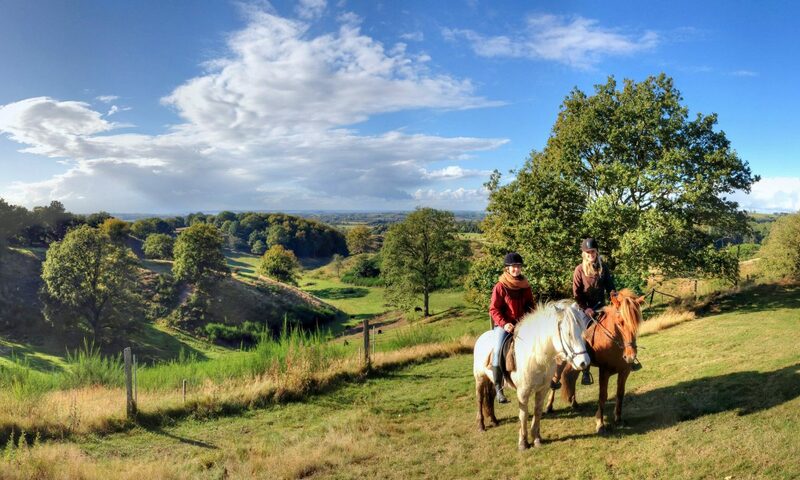 First and last trip, however, is an amazing experience of moving through the countryside on horses who have the joy of the attentive to go forward and work with the rider and with the rest of the Pack. The view of the Svanninge Bakker in direction to the Southwest. There is talk about a weekend trip with overnight stay near the water where we have agreements in place, so that we can make kept on a høhotel East of Faaborg. Consultation between the riders in the ring. 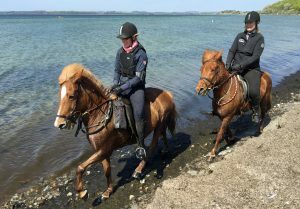 The program for these upped trips start Friday afternoon with a shorter trip, where you can try horse and choose the right for a long trip. 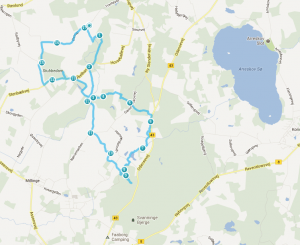 Map of part of the route near M.
After accommodation in M we ride to Svanninge Bakker, through the Svanninge hills and Høbbet and ends the day on a fine Bed and Breakfast close to water by & Nab. 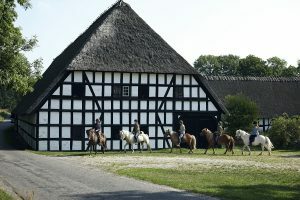 Here eat and stay overnight in the beautiful surroundings of horses and riders. Like real Vikings bathes with the horses before heading on Sunday goes further through Holstenshuus and Sollerup and ends in M late in the afternoon. 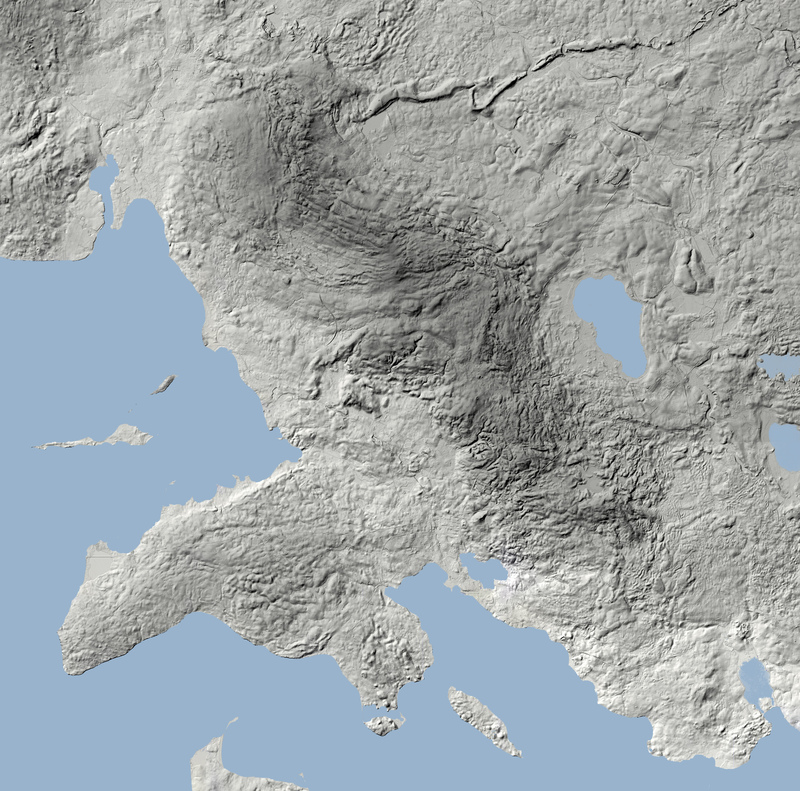 The Fyn Alps accounts clearly that the dark area at this altitude map (reworked material from the base map of Funen). Glacial landscape was created by the glaciers that covered large parts of Denmark for 15000 years ago. The Fyn Alps stretches from landless in the West to Vester Ã…by in the East, and centrally located Svanninge Bakker, who has an exciting history, where one can still find drawings of high fields from the middle ages. Along the way on horseback riding through the glacial landscape do we kept and make stretch-leg-breaks on several of the most exciting places in the amazing cultural and historical landscape. There are many archaeological sites in the area, which is also the map from the heritage agency of Denmark including displays. 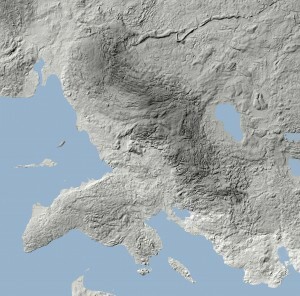 The Fyn Alps is rich in archaeological sites. 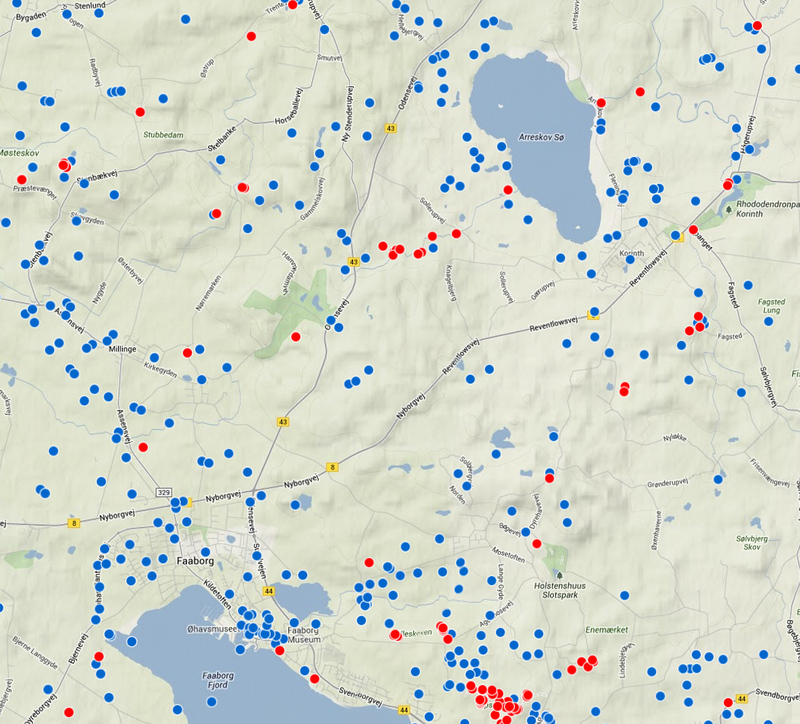 Map from the heritage agency of Denmark. –M station, there is a manor house built around an ancient medieval castle mound. –Trente Mølle, where in association with M farm already in 1500-century was built a water mill, and in 1868 installed a steam engine. -Stone nozzle in Tranesvænget, there is a nice sight in the bottom of the beautiful beech forest. -Parish gap at Rislebækken, which runs along one of the most beautiful valleys on the trip. 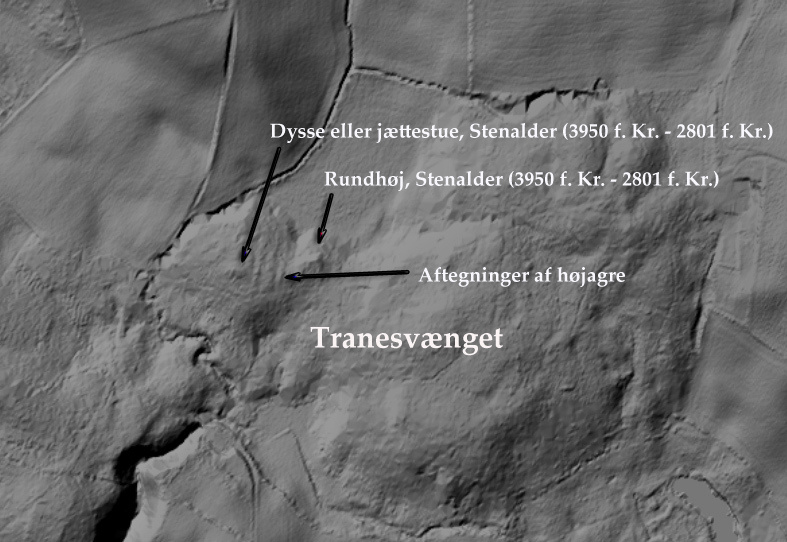 Local height map displays Tranesvænget with burial mounds and højagre. 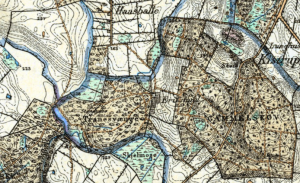 From Basic Maps Of Funen. –Svanninge Bakker, who after the storm in 1999 has been brought back to the open country, which gives a great view of the hilly terrain. –Holstenshuus goods, whose history dates back to 1300 century. -coast at Beech Mountain, with the bath water and views of the island and Avanakø. -Pipstorn forest, with a fantastic collection of burial mounds from the stone age for more than 5000 years ago, up through bronze age and iron age until 1000 years ago. 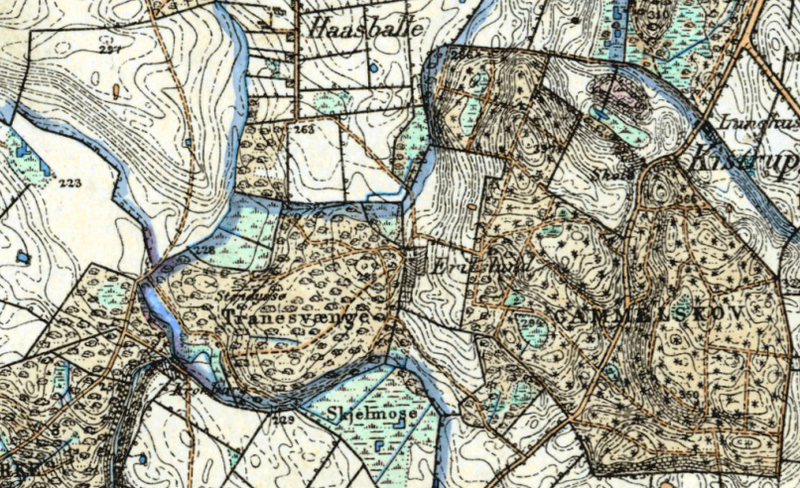 Tranesvænget with indication of stone nozzle on an old map from 1842-1899 (basic maps of Funen). 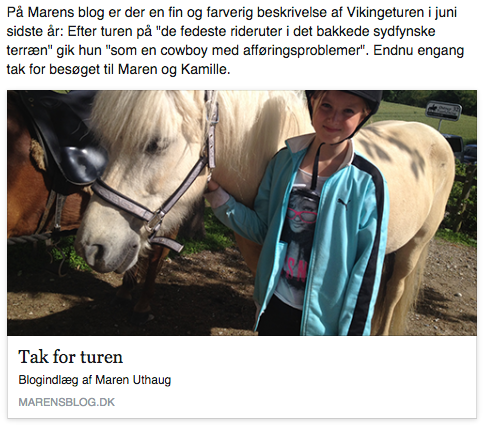 -Sand mountain farm, where Shreekrishna Uncle Torben Knock in a lifetime stood for logging in Svanninge Bakker. -Trebjerg, with a beautiful view of Helnæs Bay in the Viking era may have been Assembly port for naval expeditions in the Fyns wiring before strangers. The prospect of the water. Photo askeris.dk. Man rides an hour, get dinner Friday and overnight in M. Saturday all-day ride and you may stay in double rooms at Askeris, a Bed & Breakfast near the water. Sunday is there full-day riding tour with lunch and ending at about 16. The tours can be conducted with groups of 6-8 people.